Cream the butter, then cream the sugar in gradually. Add the egg, vanilla, salt, cocoa powder, and yogurt, and beat well. Beat the flour in gradually. Roll into half-inch to an inch diameter balls and place on an ungreased cookie sheet. These cookies should be crisp on the outside and chewy on the inside. You’ve got a decent amount of leeway with this recipe; if you leave it in for a few minutes too long they’ll be fine. Less chewy and more crunchy, but still very good. A mixer, either a hand-mixer or a stand mixer, will turn this into a very quick recipe. And also give you one more thing to lick in the morning. This makes about two baking sheets full of cookies, depending on how much of the batter you eat. I stole this recipe from The Fannie Farmer Cookbook, changing things around for what I have in my cupboard/refrigerator. I exchanged yogurt for the milk (full-fat yogurt, of course) and cocoa powder for the unsweetened chocolate. Then a bit more butter and vanilla because I like butter and vanilla (and because I’m using cocoa powder instead of chocolate). The Fannie Farmer Cookbook is a great basic cookbook; when I can’t find something in my weird books, I tend to use Fannie Farmer. 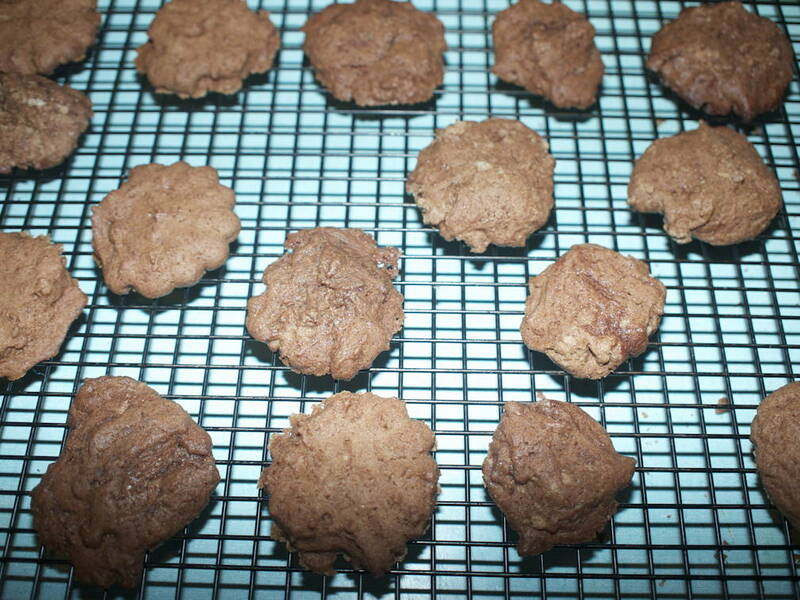 July 23, 2012: add a half-cup to a cup of walnuts to this recipe and they move from awesome to sublime. Which they’d better, given the price of walnuts nowadays. Chocolate cookies (for breakfast) last modified July 23rd, 2012.